“Red's Portrait” is an original, one-of-a-kind pastel drawing on linen signed by the internationally acclaimed artist, humanitarian, and actor, Red Skelton. This original linen was dedicated by the artist to “Laura Dear” and dated 1981. This unique work of art measures approximately 19” in height and 16” wide and is framed to an approximate measurement of 22” x 19”. 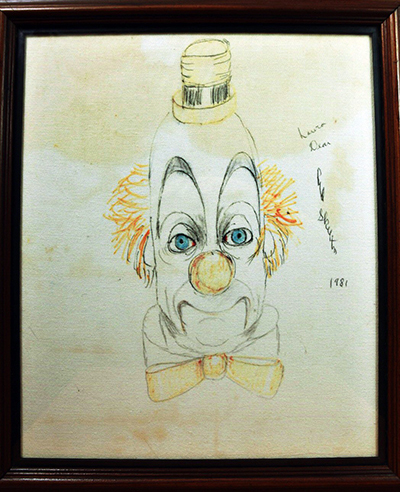 The rare drawing reflects a youthful Red Skelton with orangish-red hair and yellow bow tie. The artist was obviously known for his red hair and blue eyes which he memorialized to his friend Laura.